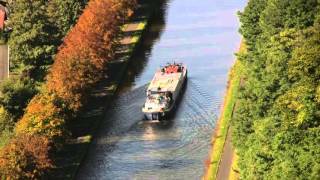 Aboard the twelve berth Panache, your floating hotel, you'll discover the beautiful waterways of Alsace & Lorraine. With a distinctive German influence, the little known area of Alsace, in eastern France, is an eclectic mix of historic towns, Baroque architecture, gastronomic delights and fine wines. The cruise visits the Gothic cathedral at Strasbourg, ensures some time for fine wine tasting and you'll experience the dramatic boat elevator at Arzviller - not for the faint-hearted! This cruise is fully inclusive of six nights accommodation, gourmet meals, fine wines and open bar, daily excursions, local transfers and full use of all onboard amenities. The designated meeting and drop off point is Strasbourg. Other options are available for charter groups. The starting day for this holiday is Sunday. Guests are met at the designated meeting point in Strasbourg and escorted to Panache which is moored in the centre of the city. Meet the crew with a Champagne welcome aboard and settle in to your air-conditioned suite. There is time to explore the city before dinner is prepared by your on-board chef. Panache is a spacious, 128 feet long hotel barge featuring a stunning sun deck, a social dining and bar area with a piano and 6 double or twin junior suites, accommodating 12 guests. There are six crew, including an on-board chef, to ensure a comfortable and relaxing stay aboard. There are panoramic windows in the saloon bar area and the barge has been finished in a traditional yacht style with brass and mahogany fittings. The large sun deck features a spa pool and an alternate dining area. There are twelve bicycles for guests' use, to explore the scenic towpaths. All cabins are en suite and have twin handbasins and oversized showers. You can expect to find wines such as Pinot Gris, Gewurztraminer, Pouilly Fume, Reisling Grand Cru and Chablis Premier Cru on the wine list. The cheeseboard will also feature regional greats such as Tomme Fermier d'Alsace, Munster-géromé, Tomme de Yenne, Mattons, Roussot and Caprice des Dieux. Today, we take a guided tour of Strasbourg, visiting the 12th century Gothic cathedral which is home to an astronomical Renaissance clock and a soaring spire. Also, you will see Place Gutenberg and La Petite France, taking in the quaint half-timbered houses, cafés and boutiques. After lunch, the cruise sails through the Brumath Forest to the beautiful village of Waltenheim-sur-Zorn where the Captain will take you to a typical Alsacian inn, reminiscent of Hansel and Gretel. Dinner on board. Following a hearty breakfast, the cruise continues to Dettwiller where you’ll have some free time to maybe use the barge’s bicycles to explore the town. After lunch, we take a scenic drive through the hills of the Vosges to the famous Route de Vins d’Alsace where you will have a private tasting of the fine white wines, Pinot Noir and Reisling, amongst the stunning vineyards at a long-established winemaker. Dinner on board. Today, we take a guided tour of the last privately owned brewery in Alsace, Meteor Brewery founded in 1640, with an optional beer tasting. On our return to the hotel barge, we cruise to the enchanting town of Saverne, mooring at the foot of the Château de Rohan, also known as the `Versailles of Alsace`. The town can trace its history back over 2000 years to Gallo-Roman times and we should have time to explore the many testaments to this - remains of Roman walls, medieval walls, Romanesque cloisters and crowned castle-forts. Dinner on board. For any early risers there is the option to take a visit to a local bakery to see the highly skilled patissiéres preparing their delectable creations. We then cruise to our next destination, Lutzelbourg, where we visit the mountaintop village of La Petite Pierre taking in its medieval castle, then on to the outstanding René Lalique collection, viewing over 500 stunning examples of Art Deco and Art Nouveau glassware. We are also close to the World War Two battleground of Wingen-sur-Moder where the American infantry engaged in some of the most intense combat during the conflict. Dinner this evening is ashore at a nearby restaurant. We start today with a scenic cruise through the Alsacian countryside ending with a visit to the Lehrer Crystal glassworks. We then ascend the unique Arzviller boat elevator which takes Panache 450 feet up the mountainside in minutes. After lunch, we visit Sarrebourg to see the remarkable 12 metre high stained glass window by Marc Chagall in the Chapel de Cordeliers and the impressive museum of Roman and Medieval artefacts. To end the day’s cruising, we travel through Arzviller’s two tunnels to our final mooring in Niderviller. Captain’s Farewell Dinner on board. After breakfast, guests disembark Panache and are transferred to the designated drop off point in Strasbourg.